Vacations are great, vacations are fun. We cannot wait for them. If you are from the financial capital of India like me, then you may have already done or thought of traveling to Mumbai to Goa by road. The trip offers great views and helps one reach Goa in less than 12 hours. But what if I suggest a slower form of travel? How about traveling on roads that kiss the beaches on the western coast? Sounds like fun, doesn’t it? 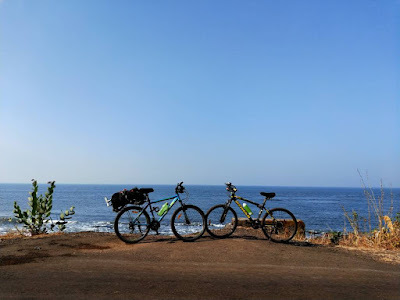 For all cycling enthusiasts, and for others who want to cycle tour someday, below is an account of our trip from Chiplun to Mumbai. The trip followed the coastal highway, and took us 6 days in total with a rest day in Harihareshwar. I am sure that experienced cyclists will do the same route in half the time, but the idea is to enjoy life at your own pace; right? 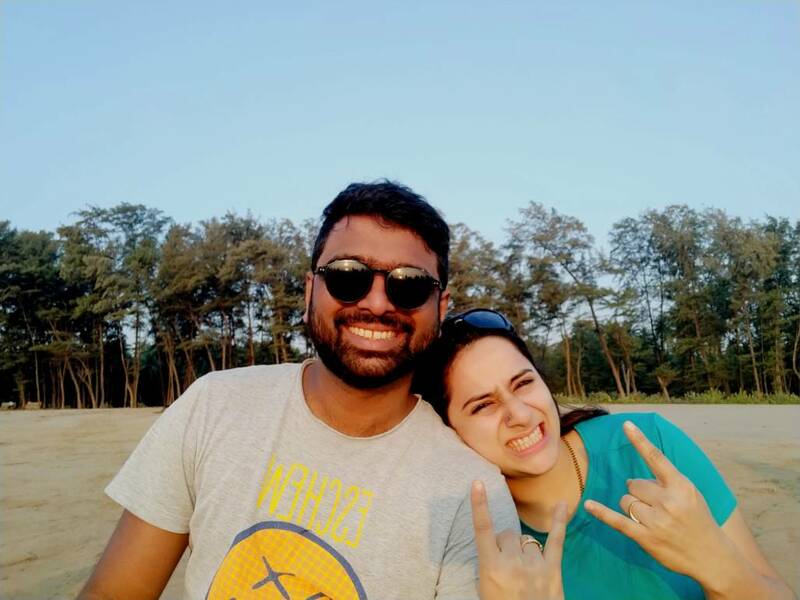 My wife and I were refreshed with the inspiring views of the Arabian sea, unexplored beaches and simple meals in coastal villages. Though the trip maybe slightly difficult for ones who haven’t cycled before, it is definitely not a factor for you to turn down the idea. We started on Sunday, 23rd December afternoon on Matysagandha express, the train was to take us to Chiplun. We decided to cycle back to Mumbai rather than starting cycling from there, and figuring out our transport on the way back. In the end it was a good decision, towards the end of the cycling trip it would have frustrated us to sort out logistics. We cycled our way into Chiplun town the same evening. Found a clean and comfortable lodge to stay, called Kane Bandhu on Shivaji Chowk. Dinner was at a restaurant nearby, and our cycles were parked in the lodge compound itself. We started at 7.30am. Chiplun is about 50kms inland from the coast and we wanted to reach the coast to enjoy the scenic ride on the coastal highway. Guhagar is the closest coastal town from Chiplun. The route was fairly straightforward, we got on the Chiplun-Guhagar road and followed the road till we reached Guhagar by afternoon. This stretch of 50kms has comparatively good roads and we encountered two ghats on the way. It was a bit challenging as it was the first day of our travel and neither of us had physically prepared for the trip. The views and the breeze, though, kept us in good spirits. Our stay for the night was Vyadeshwar temple. If you make a booking for a Pooja or Abhishek worth 200rs, then you can also stay in one of the rooms behind the temple for another 200 bucks. The rooms are nothing to write about, but I enjoy the feeling of staying in a temple. Apart from the beach and parasailing rides, Hotel Yogeshwari was the highlight. Their vegetarian thali, Modak and Gavran(konkani version of the dosa) were absolutely delicious. This was a challenging day of cycling for both of us. We left early morning for Dhopave ferry junction, about 18kms from Guhagar. There are decent climbs on the way to Dhopave, then a plateau which is followed by a descent. Right when you think the tough part is over, there is a hill that needs to be crossed before you arrive into the ferry station. We missed a ferry by a couple of minutes and got time for a breakfast of Poha and Tea. 45 minutes later we were on the other side, in Dabhol. It was 10.15 when we left Dabhol and our next stop Dapoli took us over 4 hours to reach despite being only 28kms away. This stretch was the most challenging due to the slow and gradual climb, and then the lack of tree cover on top of the mountain. Had to ride through this for over an hour or so. 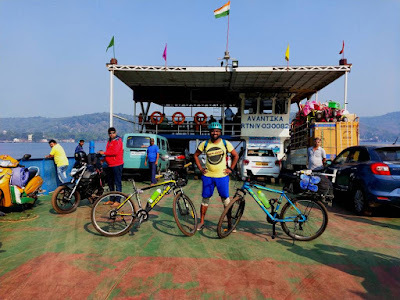 What kept us going was the fact that Harnai, our final stop for the day, was only 16kms from Dapoli and it was known to be a super pleasant ride. The sunset in Harnai was a memorable one, so was the stay. We stayed at a home-stay run by the Mehandale family. 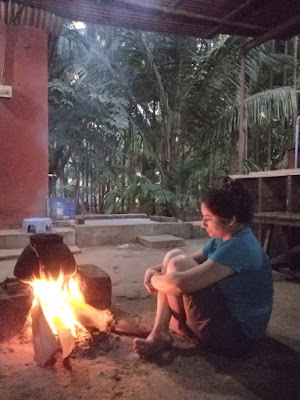 It was like how a homestay should be, it felt as if we were visiting our own relatives. Not to mention the divine food for dinner, which I binged on. My favourite was the koshimbir or the Maharashtrian style Cucumber salad. We left late on this day, acting a bit lazy owing to the homeliness of the Mehandales’ hospitality. A small upward stretch later, we descended into the beautiful village of Anjarle. This village gives you an idea of how things might have been a few centuries ago in coastal Maharashtra. Also what follows might be the most gorgeous stretch of this route. For almost 6kms the road runs parallel to the sea, making for breathtaking views. It was impossible to move on without indulging in selfies and pictures. Our breakfast stop was the village of Kelshi. We also chose this village to take a motor boat and cross the river, and reduce our journey by 17kms. Loading our bikes into a boat and crossing the river was a lovely experience. But a hillock with steep climbs awaited us on the other side. With absolutely no one except us on this road, the experience was slightly eerie, but that’s the fun! In an hour we were in Velas, the village famous for its Olive Ridley Turtle Conservation project. With a great lunch we left for Bankot to get the ferry to Bagmandla. Harihareshwar, our stop for the day was a few kms on the other side of the Vashisti river. I am not a big fan of Harihareshwar, and it is an example of how bad planning and mass tourism can destroy the very reason tourists arrive in the first place. Sarika was not feeling too great, and we decided to take a break. We spent time reading, sleeping and eating. We were planning to reach Murud on this day. But we left later than planned, bought some medicines for Sarika at Shrivardhan and reached Diveagar in time for lunch. Harihareshwar to Shrivardhan is about 22kms and Diveagar from there is another 20 or so. Though we had a couple more hours of cycling in us, we decided to halt in Diveagar as there was the worry of not making it in time for the ferry and having to cycle in the dark. The highlight in Diveagar was Suhas Bapat Khanawal. Look them up on google maps, and ideally a day in advance if you are planning to visit them. 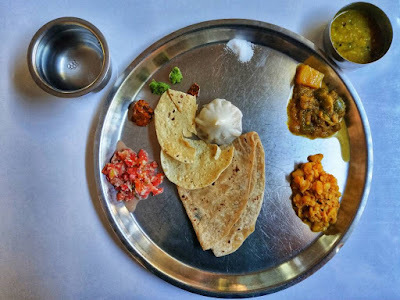 The food is vegetarian, fresh and cooked by the family along with local women. I can easily say that this was the best meal of the trip. We also found the waters of Diveagar beach to be very refreshing. Hopefully, this coastal village will be able to maintain its charm for years to come. This morning we left on time, and were there to get the first ferry from Dighi to Agardanda before 9am. After a 20km ride peppered with bad roads and some steep inclines, we rewarded ourselves with spicy breakfast dishes and tea. Within a couple of hours we were in Murud, but bypassed the beach to head to Kashid. We were hoping to be in Alibaug that day, it would have been a 70kms + ride. We took a lunch break at Borli after Kashid. Around 5pm, we were in Nagaon, a coastal town 7kms away from Alibaug. Both of us felt it was best to call it a day there, as Alibag would be crowded and getting a place to stay would be difficult. Also year end attracts swarms of young men to Alibag who are on a mission to get drunk and put their worst behaviour on display. Clearly, we prefered avoiding that. We stayed at a nice cottage among a plantation in Greenwood cottage. Last day of cycling, and we were expecting it to be super easy. The route was flat, and in about 35kms we would be in Rewas for the ferry to Mumbai. Another 11kms from there and we would have been home. But as is the case with travel and also life, you get what you don’t expect. For some reason, the ride was tough and we were bone tired by the time we got to Rewas. We started encountering traffic for the first time as we were getting closer to Mumbai, and we missed a ferry by a few minutes again! After waiting a while, we finally got a ferry at 1 in the afternoon and were in Mumbai around 3pm. 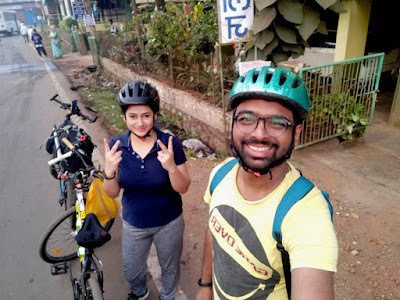 Despite being a Saturday, the traffic in Mumbai was more than either of us could handle(we do not drive and until that point we were not even cycling regularly in the city). But despite these hiccups, we were home at 5pm on 30th December. These were the most beautiful days of our relationship, and I have listed the benefits of cycling with your partner in my earlier blog post here. Hope this helps some of you plan this trip. Let me know in comments what other content from Eccentrips will help you in your cycling journey. Will be more than happy to create and share at the earliest possibility.